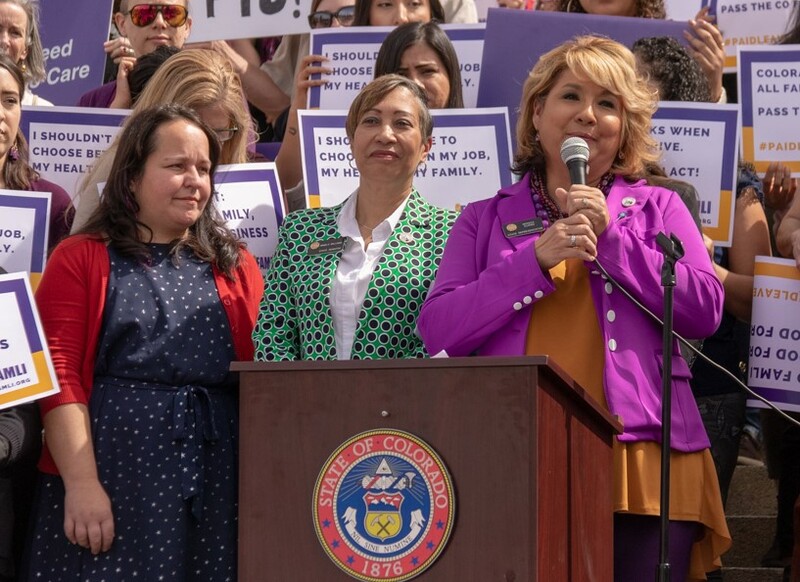 The rally today organized and hosted by 9 to 5 Colorado, an organization dedicated to influencing the public agenda for working women’s issues, and Good Business Colorado, an statewide organization of progressive business owners and industry leaders. 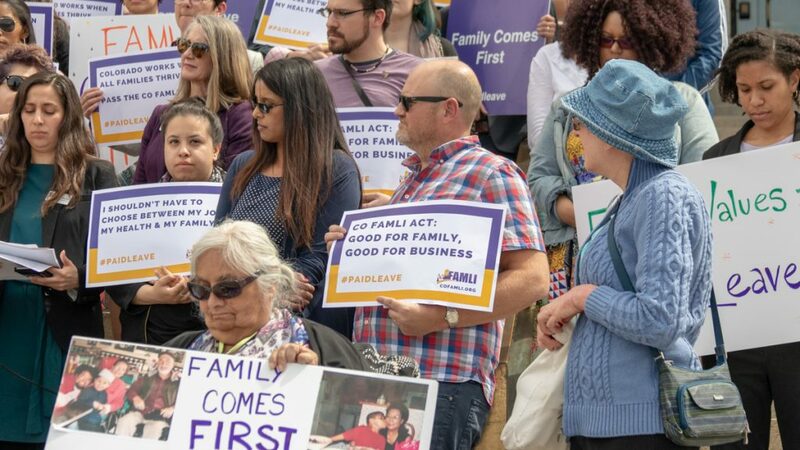 The FAMLI Act would create a state-run insurance program funded 60 percent by employees and and 40 percent by employers to provide workers up to 12 weeks paid leave. The costs to employees would be roughly $1 to $4 per week. 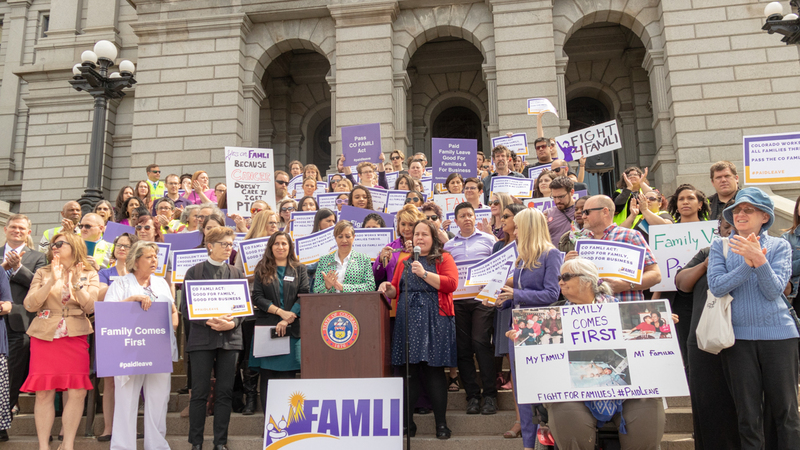 Attendees of the rally on the western steps of the Capitol included small business owners like Lisa Goodbee, owner of Goodbee & Associates, a civil engineering consulting firm based in Denver, who supports the proposed FAMLI Act. Companies throughout Colorado are not required to offer paid leave in any form. And for many business owners, especially owners of small businesses, the task of providing paid leave is often unaffordable despite the desire to do so. Pete Turner, owner and CEO of Illegal Pete’s restaurants, said he has even, in some cases, provided paid leave for his employees given their circumstance, despite his company not being able to provide that for everyone. Turner, who started his business when he was 24 and now has roughly 450 employees in Colorado and Arizona, spoke about his passion for providing a sustainable job that works for his employees. Furthermore, working families employed by businesses that are struggling to provide paid leave programs are the victims of a system working against them, according to Rebecca Zimmerman, a Masters student of social work at the University of Denver, who attended the rally to highlight the impacts of not having paid leave on people suffering from domestic violence. 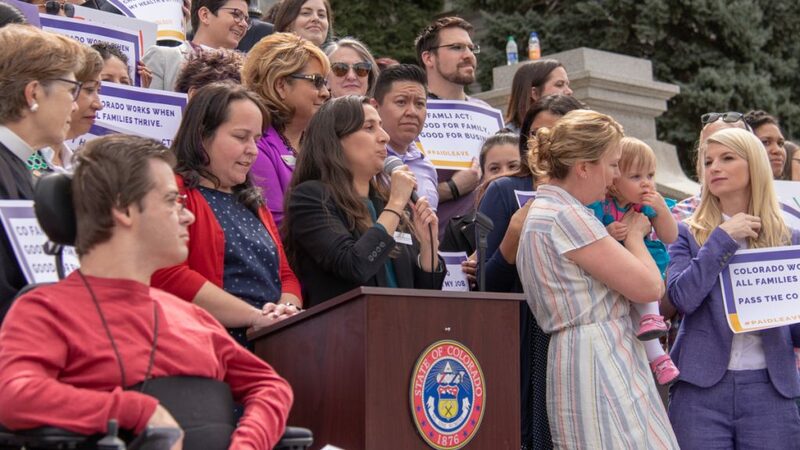 Other workers across Colorado expressed their desire for paid leave to help them deal with circumstances impacting their ability to work in their personal lives. 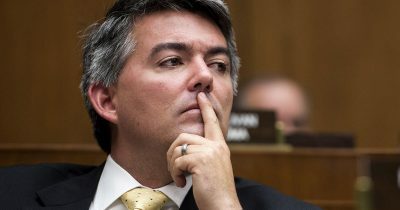 Some business groups, and most Republican lawmakers, oppose the bill, because they say, among other objections, it is too expensive and it should be up to businesses to decide whether to provide paid days off for family medical issues. They also say a federal program, which is less generous, is sufficient. 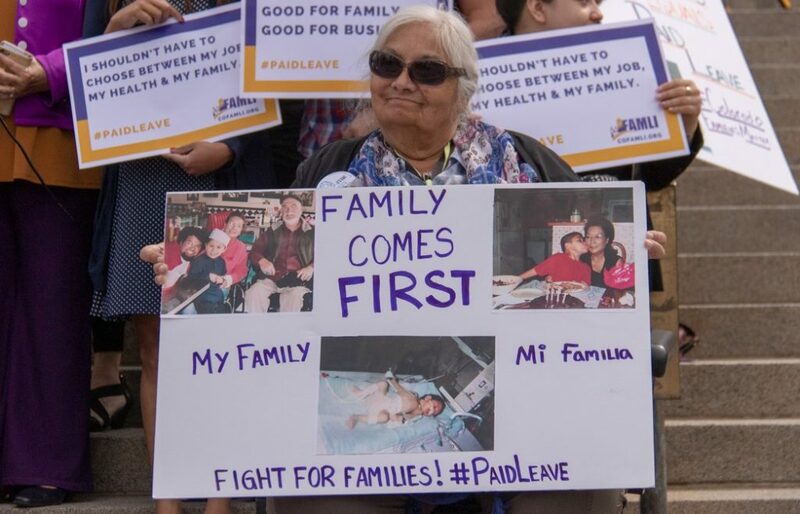 According to a recent poll conducted by Myers Research & Strategic Services and Goodwin-Simon Strategic Research, approximately 68 percent of the voters said they support paid family leave, a number which grew (71 percent) after they were given more specific information about the proposed FAMLI Act program. 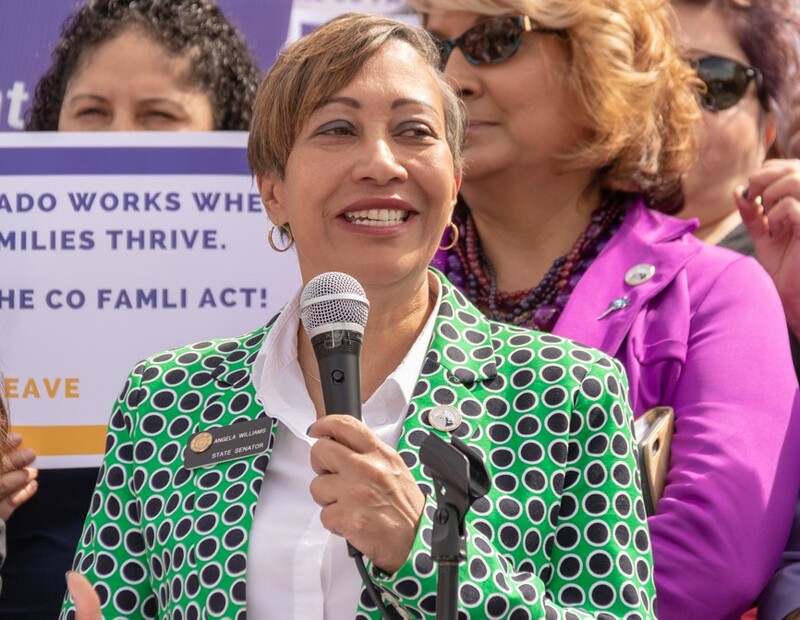 The Family Medical Leave Insurance Act, which cleared a key state senate committee Tuesday, is sponsored by State Sen. Angela Williams (D-Denver) and State Rep. Faith Winter (D-Westminster). This topic contains 0 replies, has 1 voice, and was last updated by Peter Savic 1 week, 1 day ago.